Palava laid the foundation of a green future for generations to come with the Go Green initiative that kickstarted in May last year. Organised by PCMA with the support of the citizens, this initiative encourages each to do their bit for the environment while enjoying fun weekends bonding with their neighbours. The Go Green initiative held across the weekends saw young and old citizens plant over 5,000 saplings of various trees including Coconut and Sita Ashok, across the neighbourhoods of Palava. Guided by the city’s expert horticulturists, the citizens planted saplings from the Palava’s own nursery located at Posari, a few kilometres away from the city. With each passing weekend, citizens participated with double the enthusiasm, toiling with shovels and getting their hands dirty in the mud. Palava’s Go Green initiative has been immensely successful, thanks to the overwhelming support from its people. Citizens of all ages came out on the weekends, put on their caps and planted several saplings. While parents felt there was no better way to have their children bond with nature, children couldn’t get enough of the saplings and gave them each a nickname to remember! 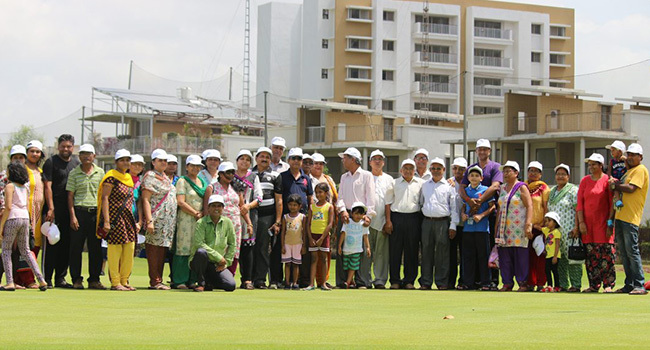 Palava citizens appreciated the initiative that made their environment greener and cleaner. Owing to the success of the events and the spirit in which Palava citizens participated, Go Green initiative led to the onset of Go Green tours that took citizens to spend an afternoon at Palava’s nursery. Such has been the support towards this initiative that now Go Green activities are being featured regularly in the city calendar through the year. Today, Palava is home to over 20,000 trees and the number only keeps growing!